There are two primary ways to compete in NASA, Time Trials and Racing. The National Auto Sport Association (NASA) has intensive competition in it’s Time Trial Program. Last year, we had all NASA regions with full participation, with over 1400 drivers nationwide. We will continue to have full participation from our now fifteen NASA regions, with over 200 events nationwide. All NASA TT Competitors can compete in the NASA Championships for additional accolades and contingencies. In total, there are seven Time Trial classes, including one unlimited (TTU), and six limited classes (TT1-6) by HP:WT ratios. Each region has its own Regional Championship Series that gives us our regional champions, and qualifies drivers to become eligible to compete at the NASA National Championship Events. Drivers may qualify in any region, and are eligible to compete in the NASA Championships, regardless of the region(s) that they qualified in. Awards are usually provided to our top-level finishers at each of the regional events. To compete in NASA TT, a driver must obtain a NASA National TT License, which requires the driver to be an advanced level driver or racer. Driver and vehicle safety are among our top concerns, and we have a pro-active safety program. Our HPDE program, that accommodates drivers of all experience levels, is the best way for a driver to become qualified to compete in Time Trial. 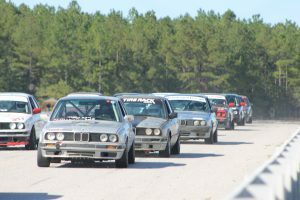 The Time Trial program bridges the NASA competition pathway from NASA-X to HPDE to Time Trial to wheel-to-wheel racing. The NASA Southeast Road Racing Championship series will feature races at all of our events. If you are interested in wheel to wheel racing, then our competition racing program is for you. NASA has created racing programs that accommodate all sorts of popular vehicles with rules that encourage aftermarket modification. NASA has a class for almost any type of vehicle ranging from Production Sedans to Stock Cars. If you do not possess a competition license, NASA has programs that will allow you to participate in a racing school to become qualified to race. If you are currently racing with another recognized organization, NASA welcomes you to our program and accepts competition licenses from many different sanctioning bodies.